Supercell on the triple point near Hills, MN. Interesting lowering that had formed in the notch of the hook underneath the updraft. Another view of the lowering a short while later. Hook of the storm wrapping around with the RFD to the left of the image. Another shot of the thunderstorm near St. James, MN. Looking northeast from the same spot in St. James towards Mankato, MN where additional thunderstorms were ongoing. 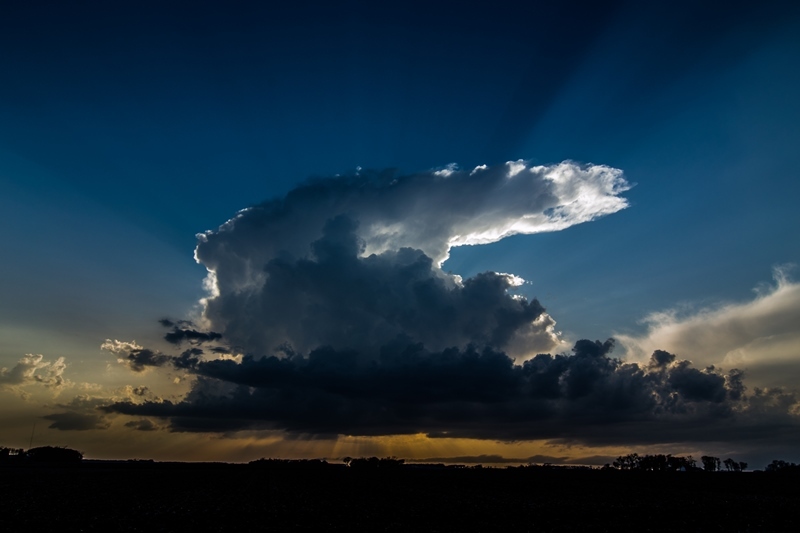 Neat towering cumulus formed behind us at sunset as we drove up Hwy 60 towards Mankato, MN. Another shot of the storm being back-lit by the sun, looking west from near Lake Crystal. 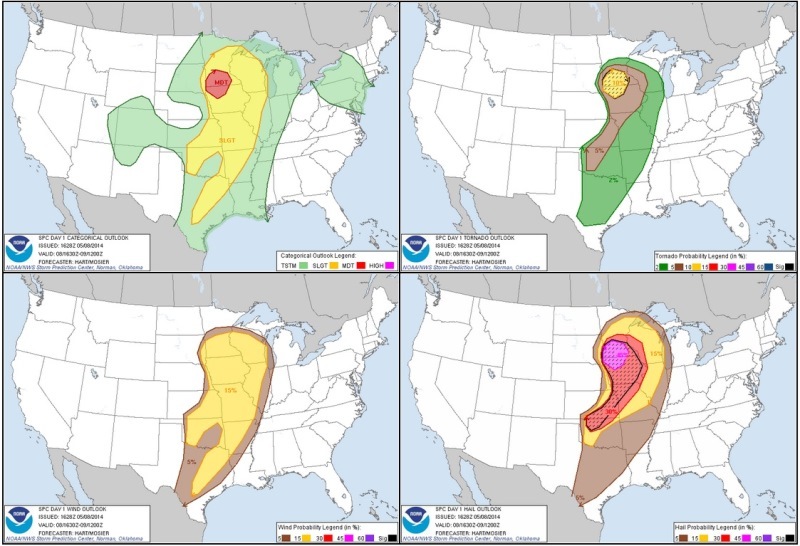 This was a rather highly anticipated Moderate Risk day across MN and IA that was expected to produce tornadoes, but ended up only producing 2 in south-central MN. The set-up included a small but vigorous 500 mb vorticity maximum moving quickly northeast into the Upper Midwest by late in the day. The upper trough was positive tilt the entire time with the southern piece of the trough shearing off in the Southern Plains. At the surface, a low pressure center was moving north-northeast through eastern NE towards far southwest MN, while a warm front became reinforced with early day convection across southern MN into northwest IA. The triple point was located in far southwest MN to the southeast of Sioux Falls by late in the day, while the eastern portion of the warm front lifted faster to the north through southeast MN. Our group consisting of me, Kyle Schanus and Joe Halverson left the Twin Cities around 9am and moved south and east to Fairmont, MN once again after being here the day before. We waited around and were met by a few others, while watching the warm front slowly lift to the north towards our location. Another round of elevated convection formed north of the warm front during the daytime hours and moved into eastern MN during the afternoon. The atmosphere quickly destabilized to the west of this convection as some clearing took place, allowing MLCAPE to increase to near 1,500 j/kg, which was less than forecast. Dewpoints climbed into the upper 60s with even a few 70F readings pooling just to the south of the warm front lifting up towards I-90 in central and southwest MN. 0-6km Bulk Shear increased to 40-70 kts across all of southern MN by late in the day, while impressive low level wind shear existed along the west-southwest to east-northeast oriented warm front. My target area was on the triple point in southwest MN, but I knew we had to keep an eye on the St. James area along the warm front as the HRRR was breaking out a strong storm in this area. Both areas would have good tornado potential, the problem was to pick which one. We conferred and chose the triple point in southwest MN and quickly headed west on I-90 as a storm began to develop along the northeast NE/southeast SD border shortly before 2pm. A mesoscale discussion was issued at 12:23pm for all of southern MN in anticipation of boundary layer supercell development in the next few hours (http://www.spc.noaa.gov/products/md/2014/md0524.html). A tornado watch was then issued at 1:50pm for the area (http://www.spc.noaa.gov/products/watch/2014/ww0130.html). As we eyed the storm approaching the southwest MN border, another storm went up back to our east towards Jackson. We decided to continue on towards the storm on the triple point, instead of following the storm to our east, even though they were both in very good environments. The eastern storm ended up producing 2 tornadoes, one near St. James and the other near Madelia. We went west on I-90, then south on Hwy 6 to intercept the storm near Hills, MN; the farthest southwest town in the state. We got on the storm near west of Hills off Cty Hwy 52 as it was producing a hook echo on radar. The storm was in a great environment and right on the triple point with low LCL’s, so it had very good potential to produce. In fact, two separate action areas formed, one on the nose of the hook and the other buried back in underneath the updraft. Both areas had slow rotation and condensation taking place, specifically the area underneath the updraft. There was a point that this storm was certainly going to produce a tornado as it was right on the warm front. However, the storm did not right turn and ended up north of the warm front where it was in more stable air. LCL’s were very low and wind shear was terrific north of the front, but it was just too stable to maintain the supercell intensity and it became a big hailer as we followed back north on Hwy 6 and then east on Hwy 8 to the north of Luverne. Knowing this storm was done and it was the only thing in southwest MN, we had to bust back east towards the St. James storm, knowing full well we would probably not make it to the storm. We did get on another storm, coincidentally near St. James towards evening, but it was nothing more than a sub-severe heavy thunderstorm. We ended up calling it quits on the chase and headed back north on Hwy 169 back home. However, another storm became tornado warned to the southwest of the Twin Cities and we intercepted this storm near Norwood Young America and followed it up Hwy 5 towards Victoria. There were several weak notches and radar detected areas of rotation along the leading edge of this line, but no confirmed tornadoes. The LCL’s were incredibly low with cloud bases seemingly on the ground and it was difficult to see being after sunset, even with quite a bit of lightning. It was really eerie following this storm into a populated area at dark and we soon ended the chase and headed home.